There are a variety of materials we use to fill teeth these days, but the process of filling a tooth is similar regardless. 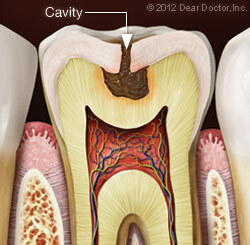 First, we do a clinical exam of the tooth and, with x-rays, determine the extent of the decay. Then we need to remove the decayed area of the tooth, usually with a dental drill or another handheld instrument. Your tooth will be anesthetized first, so you won't feel any discomfort. If numbing injections normally provoke anxiety for you, please let us know; we can discuss medication or the use of nitrous oxide, to help with this. 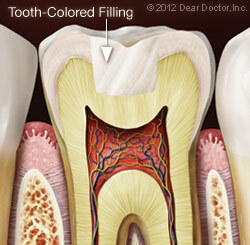 After we remove the decay, all debris is cleaned from the tooth, and then the filling material is applied. 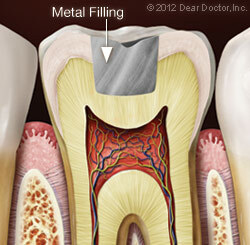 Fillings can be divided into two broad categories: metal and tooth-colored. Both have advantages and disadvantages, which we would be happy to discuss in detail with you. Porcelain — These high-tech dental ceramics are strong, lifelike, and don't stain as composites can. They are sometimes more expensive than composites because they can require the use of a dental laboratory or specialized computer-generated technology. While considered the most aesthetic filling, they can also, because of their relatively high glass content, be brittle. Glass Ionomer — Made of acrylic and glass powders, these inexpensive, translucent fillings have the advantages of blending in pretty well with natural tooth color and releasing small amounts of fluoride to help prevent decay. They don't last as long as other restorative materials. The numbness caused by your local anesthesia should wear off within a couple of hours. Until then, it's best to avoid drinking hot or cold liquids, and eating on the side of your mouth with the new filling. Some sensitivity to hot and cold is normal in the first couple of weeks after getting a tooth filled. If it persists beyond that, or you have any actual pain when biting, please let us know. This could signal that a bite adjustment to your filling needs to be made. Continue to brush and floss as normal every day, and come in to the dental office at least twice per year for your regular checkups and cleanings. Tooth decay is a very preventable disease; with good oral hygiene and professional care, you can make your most recent cavity your last!